If you’re looking to earn a California MBA, where should you go to school? 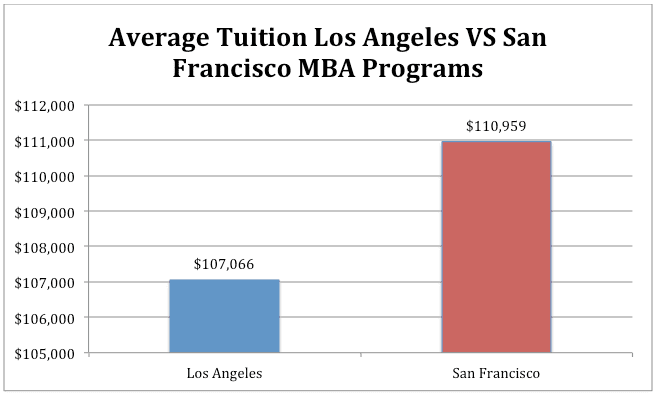 Should you choose a top MBA program in Los Angeles or San Francisco? Both cities offer beautiful weather, gorgeous beaches, and world-class business education, but is one location better than the other? To get started, it’s necessary to compare the cost of living in Los Angeles and San Francisco. According to Numbeo, the world’s largest database containing user contributed data about cities, San Francisco is far and away the more expensive place to live. You would need $7,748.24 in San Francisco, CA to afford the same lifestyle that you can have for $5,700 in Los Angeles. That’s just over $2,000 more per month needed to live in San Francisco, and here’s how that’s broken down. Right off the bat, it’s obvious that the cost of rent (real estate) is what will eat up most of your paycheck in San Francisco, but is that offset by anything? 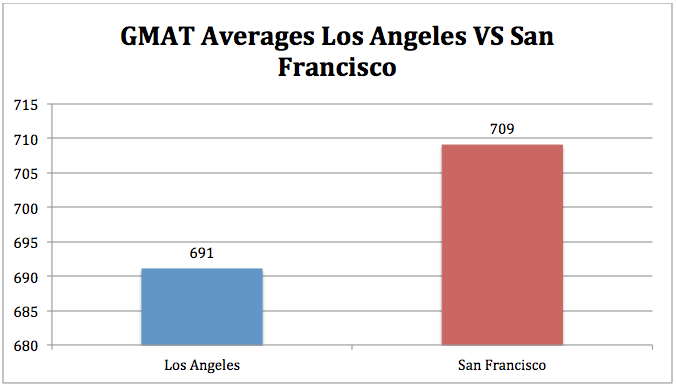 Here are the other things to consider when choosing between San Francisco and Los Angeles. Los Angeles is ranked top in the country for manufacturing with over 500,000 workers in the industry. Other top industries include banking and finance (more than 100 foreign and domestic banks), entertainment, and tourism. San Francisco, on the other hand, is known as Silicon Valley (with San Jose) for its technology companies and startups (Intel, Apple, Genentech, Google, Uber, and Twitter). It’s also a great city for finance, global business, medical science, biotechnology, tourism, and fashion apparel (home of the Levi Strauss & Co headquarters). 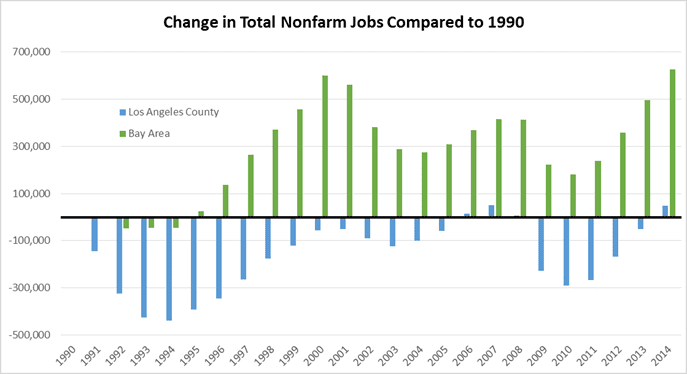 Economic Development: According to the Center for Jobs, San Francisco far and away outperforms Los Angeles in terms of economic growth and development with the Bay Area growing year-over-year while LA has struggled with almost consistent decreases. Top Companies: California is home to 53 Fortune 500 companies, second only to NYC. And more of those companies are located in the Bay Area compared to Los Angeles. San Francisco is home to Apple (3), McKesson (5), Chevron (19), and Wells Fargo (25). While Los Angeles is home to Aecom (161), CBRE (214), and Reliance Steel & Aluminum Co (320). 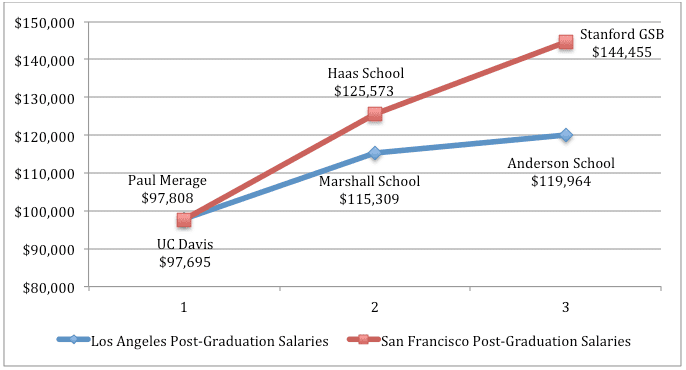 The next step is to compare the top three MBA programs in each city. In particular, we wanted to take a look at the tuition rates (two years), GMAT averages, and post-graduation salaries at each program in each city to get a well-rounded picture. There are a few things to note right away. San Francisco is home to more highly ranked MBA programs with two ranking in the top ten on every list. However, it’s important to note that both cities have programs that rank well and are considered top tier schools. The average tuition in each city is fairly even. 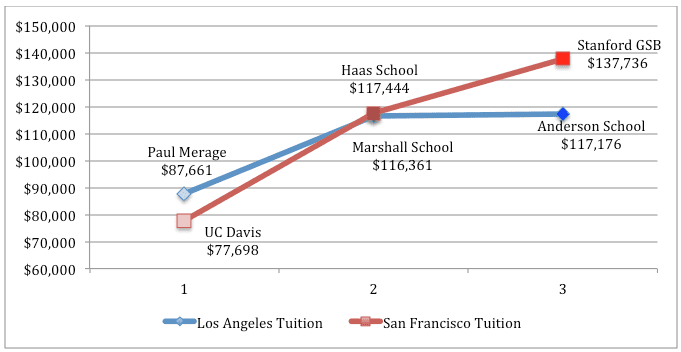 However, the most expensive ($137,00) and the most affordable ($77,000) schools are located in San Francisco, whereas Los Angeles is more even regarding tuition across the board. 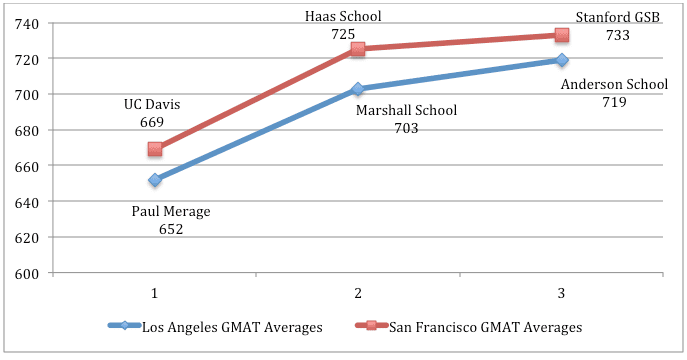 You’ll need a better GMAT score to go to a school in San Francisco, and that GMAT score translates into a higher salary after graduation. 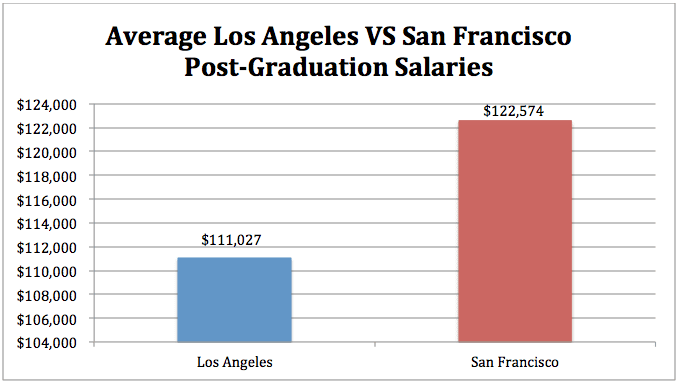 San Francisco graduates earn about $11,000 more per year compared to their LA counterparts. Here’s how it all breaks down per school. The UCLA Anderson School of Management offers a full-time MBA, a part-time MBA, an Executive MBA, and a UCLA-NUS Global MBA (Asia Pacific) program. It’s considered one of the top business schools in the world, ranking 6th in the Economist, 15th in Forbes, 16th in the U.S. News & World Report, and 25th in Financial Times. The Marshall School of Business at USC offers a full-time MBA program, a part-time MBA, an Executive MBA, and IBEAR (International Business Education and Research) MBA, and an Online MBA program. The school’s full-time MBA program is ranked: 20th in the U.S. News & World Report, 33rd in Forbes, 59th in Financial Times, and 65th in the Economist. The Paul Merage School of Business has both a full-time MBA program as well as a part-time fully-employed MBA program. In addition, the school offers an Executive MBA and a Health Care Executive MBA program. The business school is ranked highly across multiple rankings including 41st in Forbes, 42nd in the U.S. News & World Report, 56th in the Economist, 64th in Financial Times. 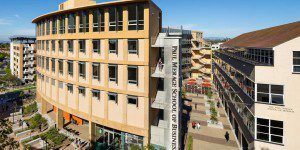 The Haas School of Business offers a full-time MBA, part-time MBA, and Executive MBA program. Haas is ranked as one of the top business school’s in the world ranking in the top ten on every list: 7th overall in U.S. News & World Report and 7th overall in the Economist, as well as 9th overall in Forbes, and 10th overall in the Financial Times. The Stanford University Graduate School of Business offers only a full-time MBA program, but it’s one of, if not the top two-year program in the world. When looking at how Stanford GSB stacks up to the competition, the rankings speak for themselves with all in the top ten and most in the top five, including: 1st overall in the Financial Times, 2nd overall in Forbes, 4th in the U.S. News & World Report, and 9th in the Economist. At the UC Davis Graduate School of Management, MBA applicants can apply to the full-time MBA or the part-time MBA program. Once again, UC Davis is one of the top schools in the world, ranking 37th in the U.S. News & World Report, 63rd in Forbes, and 67th in the Economist.